Group Camp 5 at Allegany State Park is completely renovated and a perfect place for your group or gang to get together! Call (800) 456-2267 to reserve your stay now at the brand new, completely updated, and beautiful Group 5 on the Quaker Lake side of Allegany State Park. 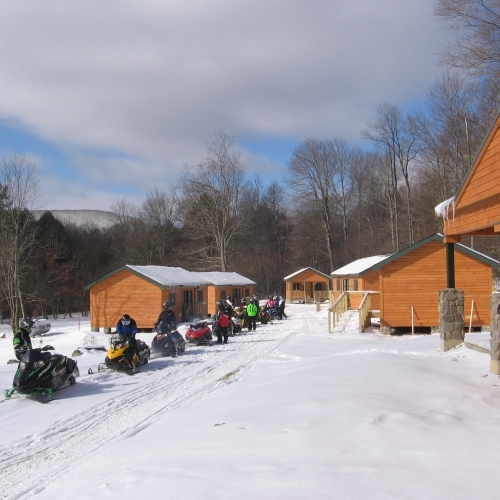 Surely big enough to house your whole snowmobile club, family reunion, or training group gathering, this camp includes 18 insulated cabins, with four beds a piece. This totals 72 people, which if splitting costs, cuts the cost down to about $6 per person per night. Each of the cabins features two separate rooms - one with benches and a table, propane heater, and beds, the other an open space to leave your gear and supplies. Take turns preparing the meals for the group in the huge mess hall that can hold up to 85 people, seated at 14 tables (included). Create a buffet line for easy access with the two serving tables as well. Leftovers and ingredients spared? Keep them in the commercial 3 door refrigerator or upright freezer. The mess hall is located central to the cabins, within walking distance from all. The facilities are worth mentioning as well, with 7 new individual bathrooms with showers, 3 of which are handicap accessible. These are also located central to the cabins, again, within walking distance. Don't miss out on the fun of bringing your group to Group Camp 5!